Sir Henry Fildes, M.P, remarked whilst speaking at the Anniversary Dinner in 1937, 'Historic is indeed the word to employ with regard to this great institution, which, for forty-eight years, has, in dark days and bright, met annually to dwell upon the virtues and enquire into the mysteries which are associated with the life of Robert Burns'. Dr. Joseph Hunter, an ex-President of the Burns Federation, had some years earlier put his point of view that, if one could catch the spirit of Burns anywhere in the country, it would surely be at a Howff Club function in the Globe Inn, Dumfries. The Burns Howff Club of Dumfries was formed in 1889 and federated in 1899 (No. 112). The Club has, since the latter date, played a prominent part in Burns Federation matters and policy, with four active Club members attaining the honoured position of Federation President. These have been M. Henry McKerrow (1937-1943), H. George McKerrow (1961), Provost Ernest Robertson (1974) and Albert Finlayson (1978). Some of our Honorary Members have also occupied this exalted chair. This is a record of which the Howff Club can be justly proud when one remembers that, scattered over the globe, there have been throughout the years well over one thousand federated Clubs. 'A dinner was held in the Globe Hotel, Dumfries. This famous hostelry was Burns's favourite resort during the closing years of his life in Dumfries, and he was the life and soul of many a merry meeting held within its walls. The chair which he occupied on these occasions is still pointed out to visitors, and last night it was occupied by Mr Beck, Dentist, who presided over a company of about forty gentlemen. Mr Kerr, moulder, and Mr Peter Robertson, draper, acted as croupiers. An excellent dinner was purveyed by Mrs Smith, the genial hostess. The toast of "The Memory of Burns", proposed from the chair, was enthusiastically pledged in punch dispersed from the Burns punch bowl, which is one of the relics preserved in the house. The toast of 'Kindred Associations' was afterwards proposed by Mr Wm. Kerr; 'The Town and Trade of Dumfries', by James Robb; 'The Hostess', by Mr Robertson, and responded to, on her behalf, by Mr Wm. Murray; 'The Chairman', by Mr Kerr; 'The Croupiers', by the Chairman. The toasts were interspersed by an excellent programme of national songs, contributed to by Mr Robertson, Mr Ramsay, Mr Scott and other gentlemen'. One could go on and on quoting speakers at the Anniversary Dinner, or, for that matter, at other functions, but one snippet from the President's oration in 1910, gives a hint of good advice and must suffice: 'Burns, like a great number of his countrymen, kept reading and learning and plodding on, with the determination to get to the front'. The winter series of monthly meetings mentioned above was soon introduced, and one finds 'gatherings' of the Club taking place, providing talks with spontaneous harmony, at regular intervals. These carried on for almost fifty years, covering a wide variety of subjects and mainly delivered by Howff Club members. The first evening was recorded as early as 1896. Examples of the variety of subjects of talks include: 'Manners and Customs of Hallowe'en', 'Lady Nairne and her Songs', 'The Power of Scottish Song', 'The Variety Stage', 'Robert Nicol - The Forgotten Genius', 'The Syme Letters', 'The Poems of Edgar Allan Poe', 'Anderson - the Surfaceman Poet', and 'The Life and Work of Roger Quin'. St. Andrew's Night celebrations are first mentioned, as such, in 1934, and St. Patrick's Night, similarly, the previous year. Club Nights had, however, been held on 30th November and 17th March for several years prior to these dates, taking the form of Song and Story Evenings or Irish Nights. Mr J.G. Home of Ruthwell was the guest speaker at the first St. Andrew's Night, when he addressed the company on 'Humour in Song and Story'. Mr Home came to the conclusion that the juxtaposition of incongruities, or, the ludicrous, was the only form of humour that some people could enjoy. The St. Andrew's Night still remains one of the main annual functions of the Club. 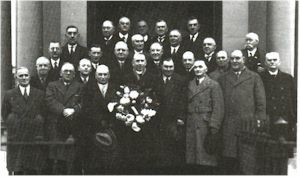 The 17th of March function, on the other hand, recommenced after the Second World War, with the last recorded meeting held in 1952. Professor McGlynn of Glasgow University, who spoke at the first St. Partrick's Night in 1933, on 'Irish Songs and Stories', set the pattern for the future, where the theme, and often the speaker for that matter, had some Irish connection. Among the notable speakers on such a night, was Sir Patrick Dollan, Lord Provost of Glasgow, who, in 1948, delivered a speech on 'The Freedom Movement in Ireland'. The first Ladies' Night arranged by Dumfries clubs was organised by the Howff Club in March, 1924, in the King's Arms. This took the form of a Whist Drive and Dance, with a turn-out of approximately 220, and representatives from the Dumfries and Queensberry Clubs were present on invitation. Dr. Joseph Hunter, the local Liberal Member of Parliament and a General Practitioner in the town, spoke at the end of a successful evening of the 'fine, energetic spirit' shown by the Dumfries Burns Howff Club, and said that if the same enthusiasm and energy were shown in many other clubs, the Burns cult would be more fully developed. He thanked the Club for not only organising the entertainment, but for all their other good work. The annual Ladies' Night is still one of the highlights of the Howff year and, well-supported by the Dumfries Ladies' Burns Club, provides the members with a chance to trip the light fantastic. A Closing Session or Supper was held from the 1890's up to and including 1959, after which it was coupled with the Ladies' Night. The Closing Supper started with Biscuits and Cheese and then, for many years took the form of a Tatties and Herrin' Night, which entailed a meal as described, together with a talk and the usual harmony. This function could be said to have been replaced, in a way, by a 'testing-for-some' evening at the start of the Executive Committee year, when each member of the Committee must display (or find) his talent, being given no option but to sing a song, give a recitation or tell a story. Another annual night which has been discontinued is the Summer Ice Competition. This was started in the early 1900s and carried on until the commencement of World War II. Summer Ice was an indoor game played on a board similar to a snooker table. Howff Club members competed annually for two cups, the Draffan Cup and the Kennedy-Robertson Cup. The former trophy is still extant, and a bowling evening is arranged each summer, when the winner receives the coveted cup. The Annual Excursion is another feature of the Howff year. Over the hundred years, the members have elected to travel north, south, east and west - Rothesay, in 1909 and Belfast the following year (both by train and boat) being perhaps the more ambitious ventures - although many a happy day has been spent visiting other areas. Methods of travel have progressed during the years - coach, train, private car and, as numbers increased, omnibus. Often on these outings, the local Burns club would greet the Club and act as couriers and guides. In addition to assisting with the organisation of the competition, the Howff Club keeps the bookshelves of all the local senior schools and the College of Technology well-stocked with current Burns-related literature. The Club itself also organises, at varying intervals, a national Tam o' Shanter Contest, the winner being the party who, in the opinion of a panel of judges, presents the best rendering of Robert Burns popular poem. In 1971 the Club ran a Miss Cutty Sark Competition for young girls over eighteen years of age, where the contestants had to wear 'a mini skirt or mini sark'. The Burns Howff Club of Dumfries has entered a float in the local 'Guid Nychburris' Parade' for many years. The first record of participation is in the parade of 1932, when the theme was 'The Friends of Burns'. The following characters were portrayed on that occasion: Robert Burns himself; John Syme, Stamp Office; Thomas Whyte, Academy Mathematician; Dr. Maxwell, Burns's Physician; Gabriel Richardson, Provost of Dumfries; John Lewars, Exciseman; Robert Riddell of Glenriddell; Patrick Miller of Dalswinton; Mrs Whyte, Mrs Richardson, Mrs Riddell and Mrs Miller, together with Jessie Lewars. Assistance from the Dumfries Ladies Club and the Brig'en' Club was given on this occasion. A float is still entered occasionally by the Club and, although much hard work is involved, it presents a Burns theme worthy of the man. Only recently, the Club presented a Cup to the 'Guid Nychburris' organisers for the best portrayal on the float of a theme depicting Robert Bums. The war years of 1914-1918 and 1939-1945, limited the activities of the Club. The Minute Book of 1914 states that 'it was unanimously agreed that there be no festivities at Hallowe'en, as a large number of members had near relatives fighting in this terrible war, for hearth and home, and no one knew the minute they would be thrown into mourning. It was impossible to enjoy oneself with so much ruin of young lives taking place at the seats of conflict.' This approach to events continued throughout the four war years. So on these occasions take the opportunity to 'sing of your pleasures, hopes and joys,' to speak of Burns and his works, and read a poem. In this way you may interest young folks and, mayhap, someone not familiar with the Poet's works, who, in due time, will join your club. In 1896 a banner was purchased from Tuthill of London. The design of the banner, which has been on display in Dumfries Museum since 1986, shows on one side the exterior of the Howff while, on the other side is embroidered a facsimile of the Mausoleum. Incidentally, the year of purchase was the centenary of Robert Burns's death when the Club, carrying the banner, was represented in the procession through Dumfries on 21st July 1896. The minutes of the Club state that it was decided to wear Tall Hats and not Tam o' Shanter Bonnets in the procession. The municipalities of Dumfries and Maxwelltown, in carriages, naturally occupied the principal position and they were followed by a car bearing wreaths sent from various parts of the world. A wreath from Australia arrived two days late and was laid at the Mausoleum after a separate ceremony. The Burns Clubs came next in order, the Howff Club carrying a beautiful flower-covered plough. All in all, between 3,000 and 4,000 people took part in the procession through the town to the Mausoleum, taking almost an hour to pass any particular spot. Fair auld Dumfries, the land o' Burns! Upon my heart have set their seal. Tae leave the land that gave me birth. The dearest spot on a' the earth. Tae come an' see ye a' again. That Scotia is my native hame. That I hae spent among ye a'. My comrades o' the Burns Howff Club. I bid ye noo a fond adieu! Mr. Kerr for many years, sent an annual poetical greeting to the Club, and this was recorded in the Minutes. He was succeeded as Poet Laureate by William Welsh, the main duty of this office being to compose an annual greeting to kindred clubs. This practice still carries on with the chosen greeting being sent to approximately seventy clubs each year. The Howff Club has abounded in characters over the years, and permission is requested to mention but a few. JOHN McINTYRE was one of the founder members of the Club. In his early days he had acted as errand boy to Jean Armour, and we are told that many were the interesting anecdotes and episodes connected with Robert Burns and his wife which he could relate. THOMAS McCRORIE, President in 1933-1934 and an active Committee Member for many years was appointed, in 1944, as caretaker of Burns House in the 'Millhole Vennel.' After extensive repairs the house had been re-opened to the public by Jean Armour Burns Brown, the great-grand-daughter of the Poet, on 25th January 1935. Mr. McCrorie was Treasurer of the Howff from 1949 until his death in 1961, and will best be remembered for his compilation of Burns's family tree, which was an outstanding work, demanding tremendous patience and research. Then there is the McKERROW FAMILY, M.H. and H.G. They have been proprietors of the Globe now for many years and have always co-operated with the Howff Club and worked closely with them. M. Henry McKerrow was President of the Burns Federation from 1937 to 1943, and was also an ex-President of the Howff. He and H. George McKerrow his son, have done much to further the Burns image throughout the world, and have been exceptionally generous to the Howff Club of Dumfries. Being a recognised authority on Burns, George McKerrow was asked to unveil a commemorative plaque to the Poet in the Theatre Royal, Dumfries, which Burns often frequented. PROVOST ERNEST ROBERTSON was another Federation and Howff Club Past President. He was also President of the Southern Scottish Counties Burns Association and had the honour, in that capacity, of bestowing Honorary Membership of that association on H. George McKerrow. Mr. Robertson was appointed Provost of Dumfries in 1965 and was greatly respected by all with whom he came in contact. DAVID CAMPBELL was a retired gamekeeper from Gatehouse who, for many years, entertained vast numbers with his wit and humour. Who ever forgot his rendering of 'The Kirkyard Ghaist,' or 'The Broken Bowl'? Dave gave 'The Immortal Memory' at the Globe Inn in 1976, when he received a standing ovation. Laced with extracts from many of the Bard's works, he discussed the attributes of the Ayrshire Ploughman, and described Burns as a home-loving country worker with a genius for touching the heart of every man. Still as spritely at the age of eighty as he must have been in his early years, Dave, up to his death in 1987, played his full part in entertaining at all Club functions and was an active Committee Member. Only a few of many! The Club piper in the Centenary Year is Ian Clowe, who first piped-in the haggis in 1961. In 1973, Ian won the top award for a piper - the Sheriff Levitt Challenge Trophy. Ian is a life-member of the Club. The charitable generosity of the Howff Club must be worthy of special mention. During its existence, the Club has always beenready and willing to support when it could, any deserving cause, supporting, for example, even a Haggis Race for charity from Dumfries to Bolton in 1980. A recent illustration of this willingness has been the very generous donation which stimulated the fund for the installation of the Burns Window in St. Giles' Cathedral, Edinburgh. Generous support has also been given to various local appeals and mention must be made of the £600 raised by the Howff Club to have the Arms of Burns matriculated at the Lyon Court on behalf of the Burns Federation. Money is raised in many ways - Cheese and Wine Dances and Fiddlers' Rallies gradually replacing an annual New Year's Draw, which was run for many years by the Club, up to and including as recently as 1984. Club functions are all recorded for the Blind and, over the years, many an enjoyable evening has been spent in Moorheads Hospital, with a Burns Supper for the patients conducted entirely by Howff members. The first account of a visit to Moorheads is mentioned in the Minutes as early as 1947. Plans for the Centenary Year include, among other activities, a donation of seats to both the Dumfries Robert Burns Centre and Moorheads Hospital, commemorative stained glass windows of Robert Burns and Jean Armour in St. Michael's Church, a plaque in Burns House and the landscaping of the area to the east of the Globe Inn. It will be seen then, that the Burns Howff Club of Dumfries carries on today the traditions of the past - good company, lively conversation, scintillating speeches and excellent harmony, just as one absent and honoured guest would have wished. There has been much in the past that is worth preserving and much to be done in the future that can only be achieved if determination is our watchword. Generation after generation have played their part in building up a fine reputation for the Club among Burns Clubs world-wide - one of friendliness, of generosity, of comradeship. Fortunately, this attitude of fellowship currently prevails in the Club and, as long as humanity aspires to hopes of idealism and equality, Robert Burns's memory will shine with undimming splendour in Dumfries and, in particular, in the Globe, his howff, which once echoed to that voice that sang and still sings in every Scotsman's ear.